The window of a Humvee rolling through Baghdad’s dangerous streets is essentially a television, watched in the dark. The glass is dirty and three inches thick: everything has a hazy and muted look, like a rerun of an old seventies movie. Humvees are dim inside even on sunny days; you can see out, but Iraqis can’t see in, any more than a sitcom character can see us when we watch. Even the proportions are right: the older Humvee windows have the squarish shape of an old-fashioned picture tube; the latest armor kits feature wider, more horizontal windows, like the letterbox of plasma screens. 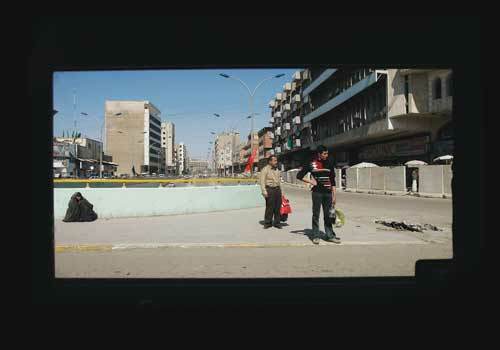 And these screens show, for the American soldier-viewers, the day-to-day life of seven million souls: Iraqi children walking to school, men lounging in chairs outside of businesses, a food seller grilling meats. Women swathed in black abayas (so rare before the invasion and so common today) shuffling through the streets. Tall concrete blast walls, everywhere. Moving through the city in the Humvee is the ubiquitous Iraq experience for US soldiers. And if there’s anything that Iraqis are inured to by now, it’s the sight of Humvees rumbling through their midst; usually, they barely look up when the vehicles thunder by. Sometimes groups of men in tea shops will still muster dark looks and angry stares. Sometimes, still, children will wave. But mostly you see practiced ignoring. For a journalist, it’s a unique opportunity to observe something that’s become almost impossible for foreigners to witness: Iraqis, going about their lives. It’s a precious window on a world that remains opaque and mysterious to Americans at home, the Americans who are bankrolling the massive occupation of a country they don’t pretend to understand. When I look at my pictures from Iraq from these past four years, I can date them with fair accuracy by the evolution of the Humvee, which has gained defensive armor gradually, like a species of dinosaur evolving bony plates over its most vulnerable spots. A picture of troops riding confidently in a thin-skinned, unarmored Humvee must have been that first summer after the invasion in 2003. (Many of the Humvees that initially rolled into Iraq were intended for use behind front lines and were thus unarmored.) A gunner standing exposed in the turret? That’s 2004 at the latest, before they started building metal boxes around those gunners, who were getting grievous injuries in roadside bomb blasts and were the easy targets of snipers. In 2005, thick bulletproof windows sprouted up from these boxes, helping the gunners to see while still affording protection. Then, in 2006, insurgents started lobbing grenades into these open-topped boxes, so a wire-mesh cover was placed over them. But sometimes the gunners were killed when grenades landed on top and didn’t fall off before exploding. My most recent trip, I noticed these wire covers now have sloping sides. Of course, the view from the Humvee window is, for all its intimacy, a limited look at a complex country. Vignettes of street life give a certain understanding of any society, but it’s a superficial, ephemeral one. Americans riding in Humvees and looking out at Iraqis know Iraq society no better than a visitor taking in Manhattan from a tour bus, with some furtive shopping in Times Square, can be said to understand New York. Missing even from months of staring at “Humvee tv” is any real information on why Iraq is the way it is. The view provides few answers though it asks many questions: What are those students learning when they get to school? Is that woman a Sunni or Shia? Who ordered that road crew to repair that street? Who is that woman—a cosmopolitan who speaks French and longs to be free of her bonds, or some wealthy Iraqi man’s third wife? (Perhaps she’s both.) What are those men laughing about; what’s funny to Iraqis nowadays? Where does that electronics seller get all those washing machines, and who buys them? Who put up that recent billboard for a cigarette brand—is Baghdad still considered a fruitful market for cigarette sales, maybe better than ever? I remember just a few weeks after the ouster of Saddam, in April 2003, I was riding around Baghdad in a taxi (we journalists speak of that world as if it were some idyllic nineteenth-century utopia, not the norm in Baghdad merely four years ago). The taxi driver spoke some English, and we chatted about the eventful past month in Iraq. A convoy of Humvees, already getting to be a routine sight, rumbled past, and I noticed the taxi driver followed them closely, his lips pursed in understated awe. What did he think about American Humvees rolling the streets of Baghdad, I asked him. Chris Hondros’s photographs appear by courtesy of Getty Images. Chris Hondros was a prize-winning phtotojournalist who died in 2011 while on assignment in Libya. He worked in Angola, Sierra Leone, Afghanistan, Kashmir, the West Bank, and Liberia, and was a finalist for the Pulitzer Prize in Spot News Photography in 2004 for his work in Liberia. He was awarded the 2005 Robert Capa Gold Medal, war photography’s highest honor, for “exceptional courage and enterprise” in his work from Iraq.